Pretty short sleeve top inserting with delicate cotton mesh panels and pretty fagotting laces, front pleat and open back layer details. Pair with jeans and sandal for an effortlessly chic, fresh summer look. Loose fit, buttoning keyhole back. Model is 175cm and is wearing size XS. Shell: 90% Cotton, 10% Linen. Contrast: 100% Cotton. QUIN’s designs are refined and wearable. Her silhouettes are often relaxed, and subtly beautiful. The attention to detail and the craftsmanship of QUIN’s pieces ensures longevity. 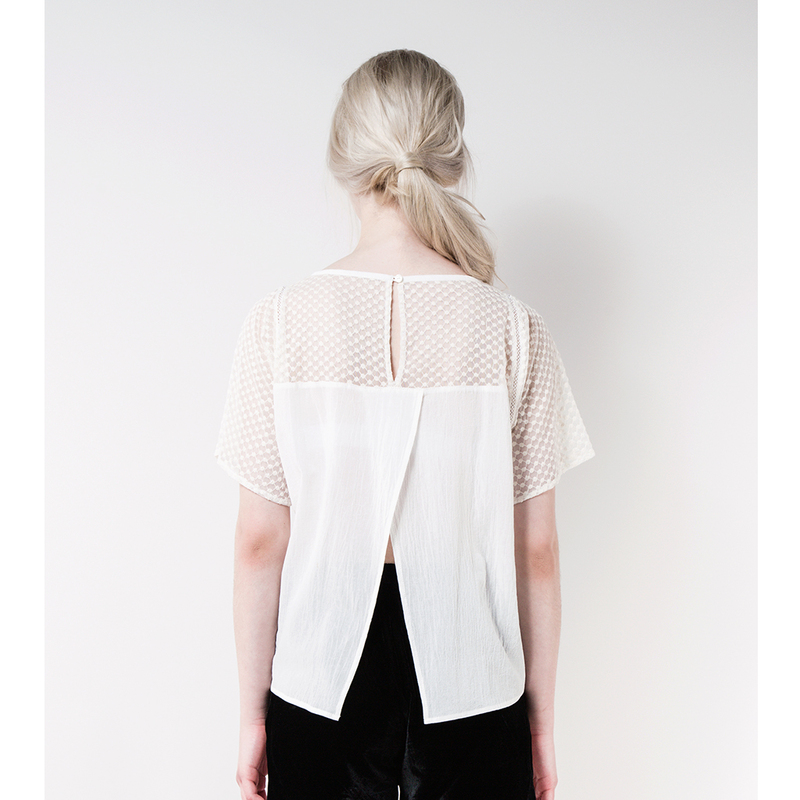 QUIN is a London based contemporary womenswear brand with a subtle approach to design aesthetics. QUIN takes inspiration from contemporary visual arts and everyday life. The focus is on combining current fashion culture with staple wardrobe pieces. Contrasting textures and attention to detail are the essential components of QUIN. Whether it’s the unusual way her lacework hangs over nearly-bare shoulders, or the cut and crease of a striped leg, there is always an unusual twist to QUIN designs that sets you apart from the crowd.